It was around 1:30, Monday morning, January 29, 2007. Monticello Police Dept. Patrolman George Strain was working a call at the intersection of E. Gaines and Conley streets. That was when officer Strain was run over by an oncoming vehicle. The force of the impact that cold, early morning, either fractured or broke his right wrist, left leg, left ankle, and multiple ribs. One of the broken ribs punctured and collapsed his right lung. He also had a broken pelvis. George spent the next 19 days hospitalized. When he was able to go home, he still had to use a wheel chair. Itâ€™s now 9 months later, and heâ€™s still in physical rehabilitation to overcome some of the muscle deficiencies from the accident, but George never gave up. George grew up in Tamo, AR., just north of Dumas and Grady. He joined the U.S. Army, received his high school diploma, and even earned college credit, while he was serving his country. In the military, George was stationed in Ft. Campbell, Kentucky,and was a member of the 101 Airborne, and the 2 / 17 Cavalry Unit.Â His military duties carried him to Germany, Egypt, & Panama. When he left the service, George worked in construction and in food-service, until he entered law enforcement. Georgeâ€™s police career began in McGehee, then Grady, before coming to the Monticello Police Dept. in August, 1999. Next month, George will be celebrating his eighth anniversary to Mrs. Dorothy. They are very active in First Missionary Baptist Church, on Bailey street, here in Monticello, and Mrs. Dorothy sings. Mrs. Dorothy is a member of the McLettic Stars, a family singing group, that has traveled to over 20 different states, singing about Godâ€™s love, mercy, and grace. Through Georgeâ€™s accident and recovery, theyâ€™ve been blessed by that love, mercy, and grace. When I was talking to him, I realized that he sees this as an opportunity to make a difference in other peopleâ€™s lives. George isnâ€™t still in that wheel chair. Last week I saw him at City Hall. He was on his way to work. 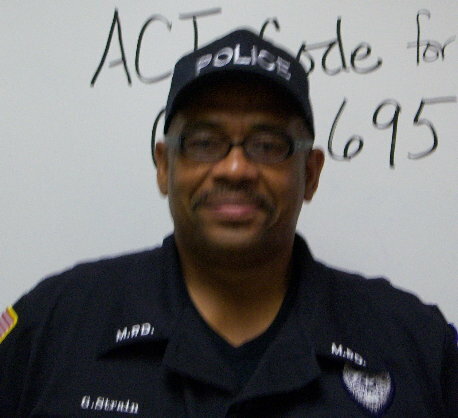 Officer George Strain is back in uniform, in Monticello, serving as the School Resource Officer for the Monticello School System. His office is at the high school, but heâ€™s on duty at all of the Monticello School facilities, spending time with the students, and heâ€™s teaching them something, simply by being there. Officer George Strain, now thereâ€™s a good roll-model for our kids, and for us. George Strain, thanks for sharing your One Monticello Life. Click here to readÂ MonticelloLive.com’s original story about the accident. Click here to read MonticelloLive.com’s original report, Officer Comes Home. Older article: How Deep Wuz Them ‘Taters? This entry was posted on Sunday, October 21st, 2007 at 1:00 pm	and is filed under Feature: OML, Site. You can follow any responses to this entry through the RSS 2.0 feed. You can leave a response, or trackback from your own site. Way to go George!!! Everytime I have seen George since that accident he has been upbeat and determined to get back to work. I am blessed to know you George. This couldnt have been bestowed on a nicer guy. He was a real friend to my nephew when he needed one. So glad to see he is back on the job. My family and I have had the pleasure of calling Mr. George and his wonderful wife, Dorothy, friends of ours! They are so loving and it’s so great to see Mr. George back in uniform again! As the old saying goes” YOU CAN’T KEEP A GOOD MAN DOWN!” To Mr. George and Ms. Dorothy.. We love you both..take care and May God Bless You Both..Always and Forever!! !